Way aye man!! Back in the UK and desperate to cook myself a good bloody meal, whilst being knackered through being thrown straight back into my day job. Urgh! Italy reignited my passion for prosciutto (crudo) and sun-dried tomatoes, but after two weeks of it, I was craving the diversity and wealth of flavours that English cuisine has to offer. During my stay in the lovely La Spezia, I failed to consume a single vegetable. Something that seemed to elude the Italian diet, or should I say the diet of those my colleagues and I were staying with. Living on a diet of meat, carbs and dry sandwiches (butter anyone?!) I craved something a bit more saucy than olive oil and balsamic dressing. Don’t get me wrong the food was great, it just lacked the sauciness that I am beginning to associate with British food. Gravy on a Sunday dinner, Birmingham’s native Tikka Masala, stews, shepherds pie, baked beans.. in England I do believe we like our food with that lil something extra. As for Italy, I can only speak from experience to say that this is something we all found wanting in the dishes we were offered. So I endeavored to cook something lovely, non dry and British, with some lovely vegetables sneaked in to nourish my wanting body. Nothing spectacularly creative here, just simple, hearty loveliness. 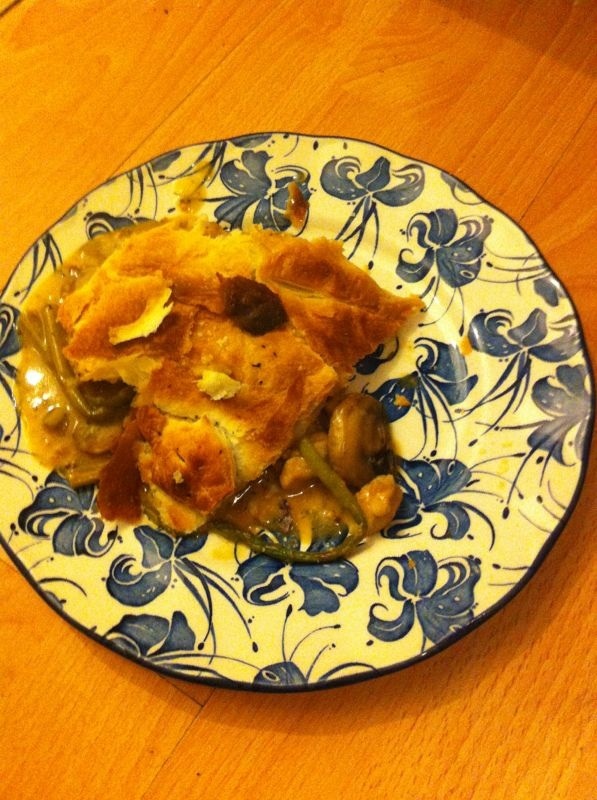 I also wanted something as easy as pie (mind the pun). Exhausted much! I did the bad thing and bought ready made and ready rolled pastry (I will not be concocting a flaky crust with any success after a hard days work)! Along with ready sliced mushrooms! They were reduced what can I say!!! Booo!!! Many a chicken pie recipe calls for a cooked roast chicken with all the meat taken off and made into bite sized, pie filling chunks. All well and good but when your after a quickie, skinless and boneless chicken thigh (or breast) will do. As always my measurements are a bit scatty, I do things by eye a lot, something inherited from my mom and dad, (much to the annoyance of my partner when giving recipe instructions), I have done my best to quantify the ingredients here, feel free to do what feels and looks right, I find that often works for me :). I used garlic powder here because I had run out of garlic. Always great to have on standby. Feel free to use fresh garlic, although it is nice sometimes to have the flavour without the bits, especially in a saucy pie, I guess it would help if I had a garlic crusher!! 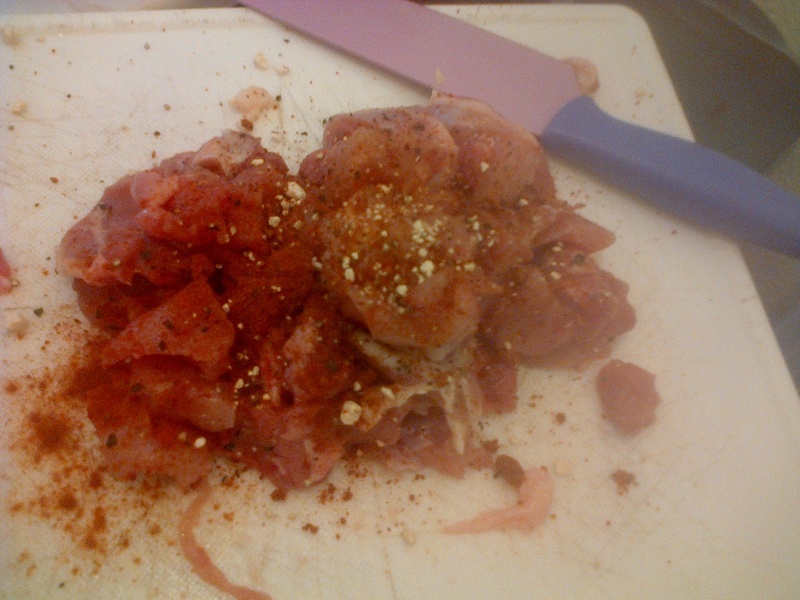 All purpose seasoning again rears its lovely flavoursome head in this recipe, I use it instead of salt due to its high salt content (roughly around 75%) . By all means use salt or even celery salt in its place. Garlic Powder (I’d say a bit but for those who like to measure half a teaspoon). Cube chicken. Coat with black pepper and all purpose (or salt). Fry onion in olive oil until translucent. Add chicken. Cook for a bit. Add mushrooms. Cook it all down until chicken and mushrooms cooked through. Steam asparagus for a couple of minutes. 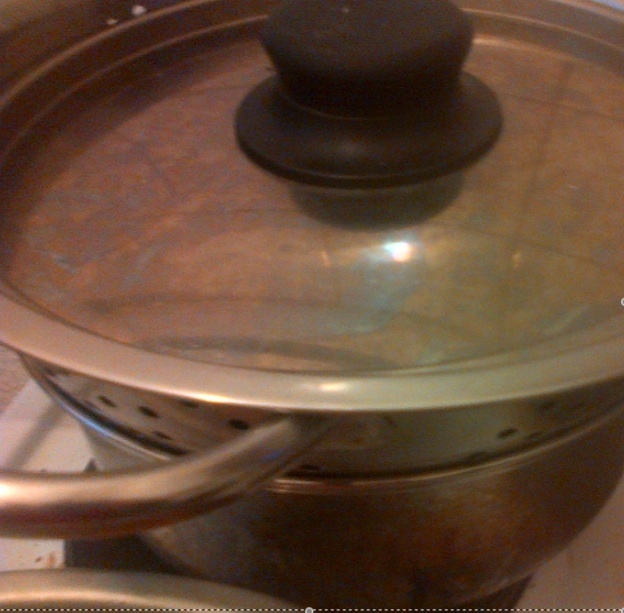 (I made a makeshift steamer with a colander over a saucepan of simmering water and a lid). Make sauce in separate pan. Melt butter. Add flour. Roux it up (cook slowly over low heat until colour of straw). Pour in chicken stock a little at a time. Turn up heat and stir until simmering. Add cream and mustard and lower heat. Cook until reduced and thickened. Sprinkle sage. Pour sauce over the chicken. Add asparagus. Stir it up. Transfer to pie dish. Add magical ready rolled pastry lid. Cook for around 30 minutes. Serve with mash and broccoli. Nom Nom!! Do not start watching Breaking Bad in the midst of making this pie, may cause one to forget about it resulting in burnt pastry disaster. Easy peasy! My partner said this was the best pie he ever tasted. I do often think he says such things with ulterior motives… That is quite the accolade! I am forever the cynic! !